The absolute ultimate in extreme inflatable games, our Obstacle Courses will definitely be the highlight at your event! Children, teens and adults alike, have a great time running through the barriers and hurdles! Bring one of our most "radical” obstacle courses to your next event! Our 66’ Radical Run is jam packed with every obstacle imaginable. Race your opponents over, around and through each barrier down the stretch to the finish line! Who will be crowned the ultimate ninja warrior? 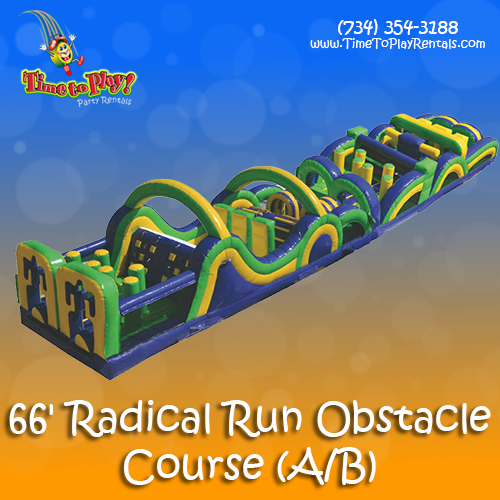 Our 66’ Radical Run Obstacle Course is great for school, church, corporate, neighborhood and any large social event!